Presence required training: depending on the option differntlich, but 4 weekends (8 days) or a block course in the standard programm – total max. 48 full hours instruction at the HQ in Münster, Germany – Or otherwise you can organize the instructor course in your country with some other participants. And then we can come to you. 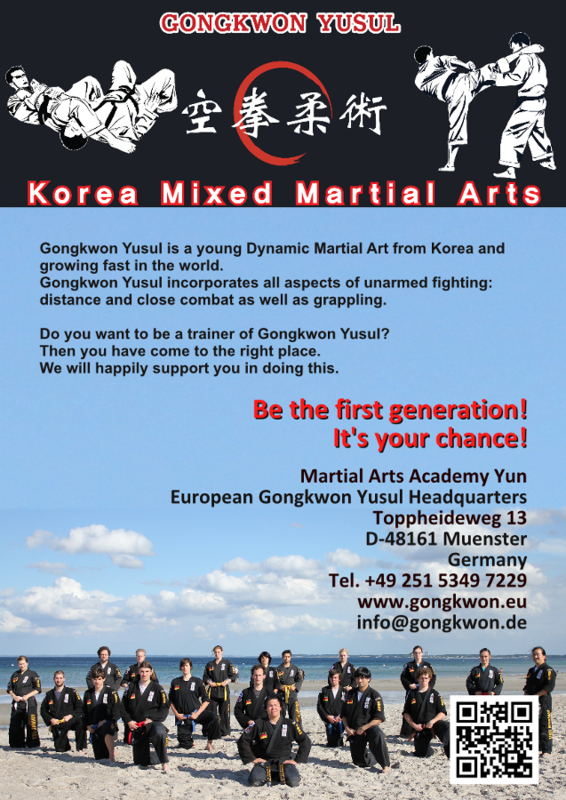 Individual training: You can come for training to the European Gongkwon Yusul Headquarters (EGH) in agreement with us, whenever you can and want to. Around 48 hours you can get an personal instruction. And you can free participate in the normal workouts at the EGH. Group training: You can participate in a group training program. The group will consist of between 4 and 8 (max. 10) persons. The units with obligation to attend are usually 48 full hours, i.e. 4 weekends (Sat and Sun). A major advantage of this option is that you can exchange your knowledge with the other training participants and try to apply the training contents. That makes a lot more fun. Remote training: You can study yourself the techniques comfortable at home with video instructions and documents. You need visit the EGH only three times and complete the rest of part with obligation to attend. This possibility is particularly advantageous if you can not easily participate in the group meetings because of your professional situation or geographical long distance. We can help you for your decision, which option suits you best. Write us an e-mail! You have an exclusive right for your professional Gongkwon Yusul school in your area (pinciple: one city, one school). I.e. : You have no business competition. You can hold exams independently for your own students in color belt degrees. You have a right to participation in all Gongkwon Yusul events and activities, also for Instructors. For example: Every two years Grandmaster Kang comes to us in Germany, will held seminars for instructors. You will get the technical support from us permanently. 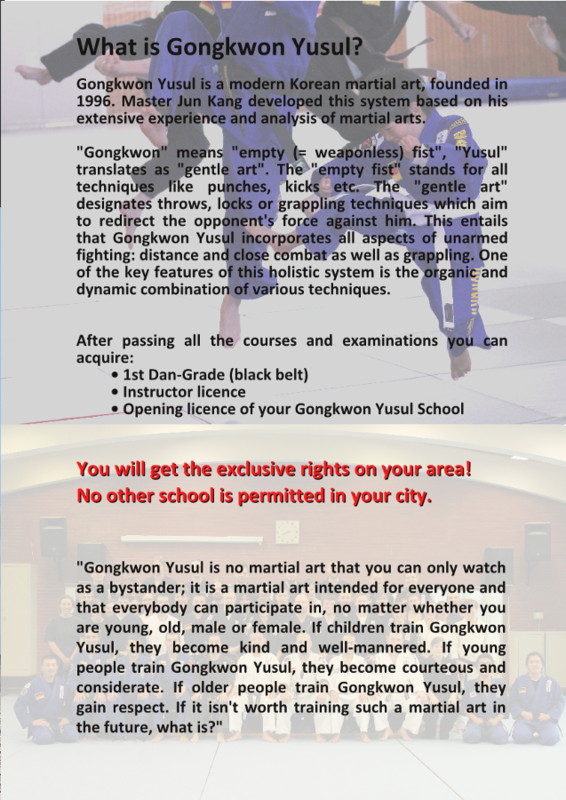 We will help you in case of build up the teaching program of Gongkwon Yusul in your gym.